Setting the Bolder Course | Striving to grow strong, be adventurous, explore creativity, appreciate the blessings and beauty in life. Striving to grow strong, be adventurous, explore creativity, appreciate the blessings and beauty in life. I remember the first time I heard about life lists years ago. I love making lists so, naturally, I started one of my own right away. A while after writing the first draft of my life list in a journal though, it eventually got hidden away and forgotten about for a time. Over the years I continued to think of it every once in a while; usually when I had thought of something I wanted to add to it, but I would forget to choose things to work on from my list so that I could check them off. Consequently, I’ve only crossed off a few things from my list, but I’m working on changing that. 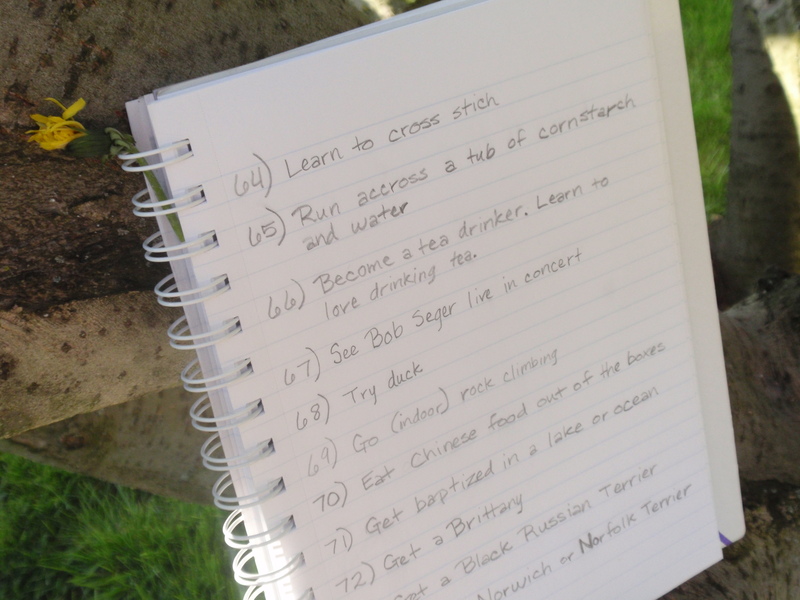 I thought it would be fun to add a page for my life list here on my blog. I titled it “A Ladder to the Stars.” While I was going over my list and typing it all out, there were things I decided not to keep on the list. For example, I laughed when I saw that I had originally had down four different instruments that I wanted to learn; now I’ve chosen to take a few off and keep the one instrument that I’ve wanted to learn for as long as I can remember: the piano. I just accomplished #4 – get my driver’s license – on April 3. It’s exciting to finally have my license. I was more than ready for that bit of independence that comes with being able to drive myself wherever I need or want to go. #22. Find several cake recipes that I love. #23. Find several cupcake recipes I love. #53. Become a tea drinker. Learn to love drinking tea. #71. Read all of the Sherlock Holmes stories. Do you have a Life List? If so, what kinds of things are on your list? Last year I said I was going to write a post a week. That didn’t happen. What did happen was I discovered that I really do enjoy writing. Before I started blogging I usually only wrote when I needed to for school, to write thank-you notes, or to write to pen pals. I had always wanted to journal, but had only written in my journals a few times over the years, because all of the times that I decided to journal regularly it would slip my mind after a few days and I wouldn’t think to do it again for quite a while. This time writing didn’t slip my mind. In fact, while I wasn’t blogging, I missed it. And even though I didn’t get back to blogging so that I could keep writing, I did do something else. I picked up my journal. Over the last few months, I’ve written in it more regularly than I ever have before, and I’ve loved doing it! I have still missed writing here, too, though. I’ve also missed interacting with some of the bloggers I have met here on WordPress, because while I’ve been away from my own blog, I haven’t been keeping up with other blogs as much either. So, now I’m back. And I’m starting fresh. I’m not planning on making any “post a day” or “post a week” promises this time around. I don’t want to feel disappointed if I haven’t kept up with a posting schedule. Instead, I’m going to try to find a writing groove that works well for me. I have a few topics picked out that I’d like write about each month, but I’m not going to worry about writing about those topics if there is something else that I would rather talk about, or if I just need a short blogging break for whatever reason. I don’t want to tie myself down with too many “rules” for my blog; I want it to be more free and spontaneous. As I was thinking about getting back to my blog, and realized that I wanted to make a few changes, I decided to freshen things up with a new theme, an updated About page, and an added Recipes and Reviews page. I’ll also be adding another page or two soon. I’m excited about these little changes, and I’m looking forward to sharing my thoughts here again! 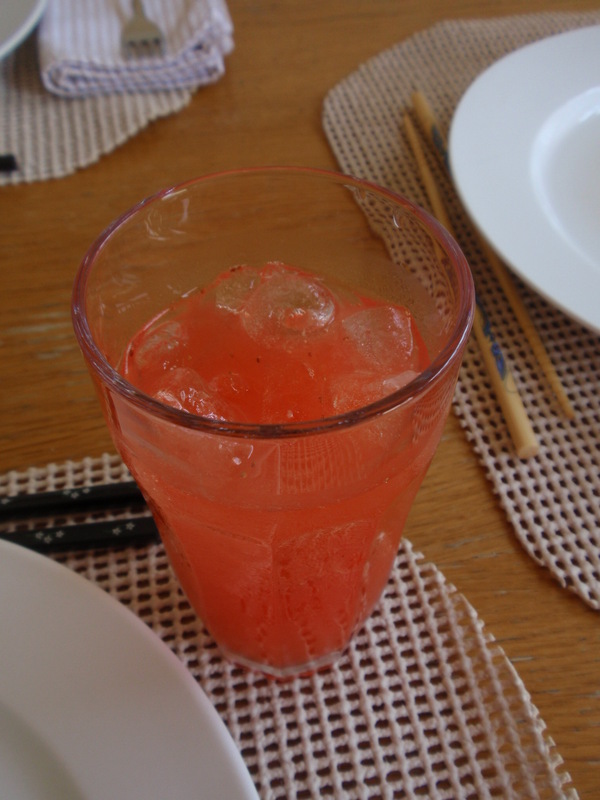 Strawberry Lemonade: The Perfect Summer Refresser! My sister and brother-in-law came over to our house for dinner to celebrate my sister’s birthday recently. Whenever they come over for dinner, I’m usually in charge of drinks. Which basically entails me telling everyone what the drink options are and asking what they would like and then fixing everyone’s drinks for them. In our house we have everything for Shirley Temples on hand almost always, but sometimes we like to get everything for a drink that we don’t have as often, like one of our favorites, Chocolate Mint Italian Cream Sodas. I’ll have to share that recipe sometime, it’s amazing. 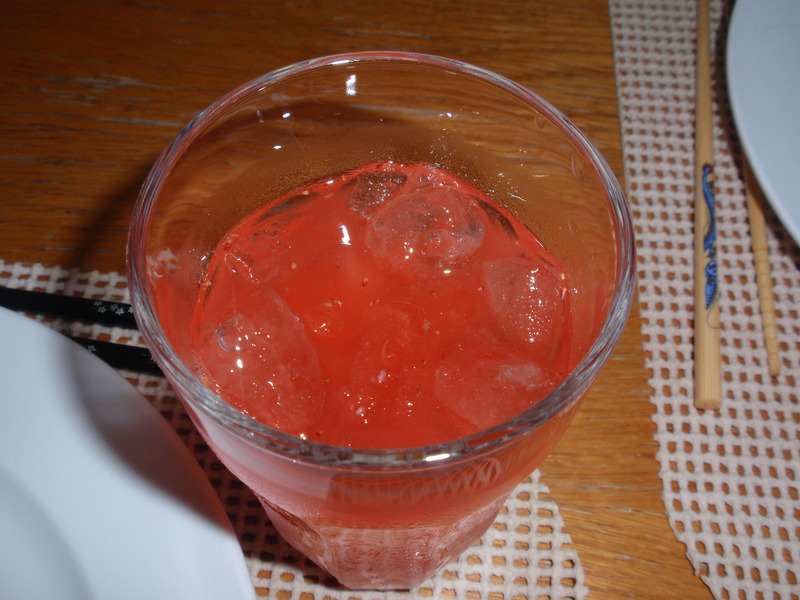 But this time I decided to make Strawberry Lemonade. I got this recipe from one of my summer issues of Everyday Food, you can find it here. And of course, I have it copied below, as well. 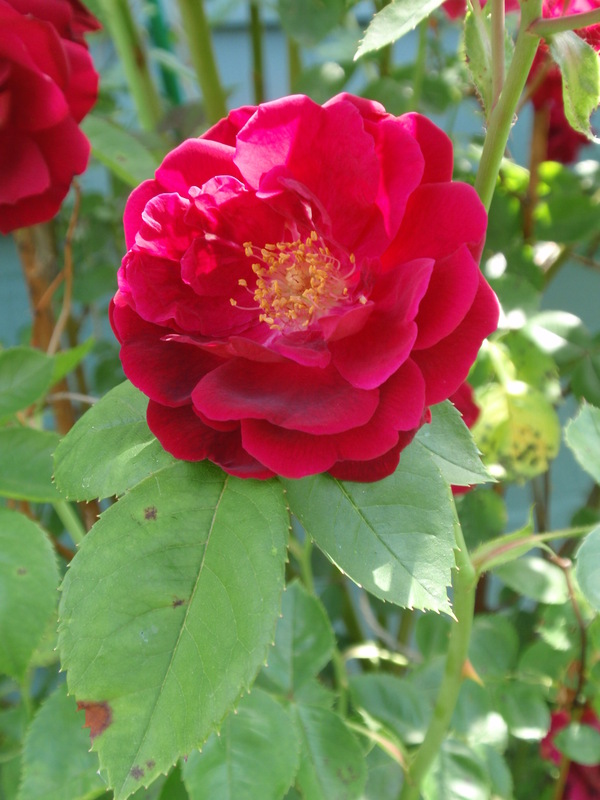 Look for fragrant, bright red strawberries with green caps. In a medium saucepan, bring 2 cups water and sugar to a boil over medium-high. Reduce to a simmer and cook, stirring occasionally, until sugar dissolves, 2 minutes. Transfer to a pitcher and refrigerate until cool, about 45 minutes. Add lemon juice and stir to combine. In a blender, puree strawberries until smooth. Pour through a fine-mesh sieve into pitcher with lemon syrup, pressing on solids. Stir well to combine. To serve, stir in seltzer and divide among ice-filled glasses. Top with lemon slices and mint. Tips for Cooking with Kids: Let the young ones measure the sugar and juice the lemons. They can also help blend the berries and strain the puree before mixing together the finished drink. This Strawberry Lemonade was really fantastic! The whole family loved it. It was just how lemonade is supposed to be, sweet with a lemony tartness that is delectable, and the fresh strawberries add a lovely flavor to an already wonderful summer drink. Definitely a great drink for the 4th of July, or any summer occasion. I learned that this is definitely a drink that should be completely made before guests arrive, which I know may seem obvious, but I only figured that out after I did it the wrong way. I had made the sugar syrup ahead of time, but I did everything else after my sister and brother-in-law had arrived, and it took me awhile to get it ready. Lesson learned: learn to plan ahead. 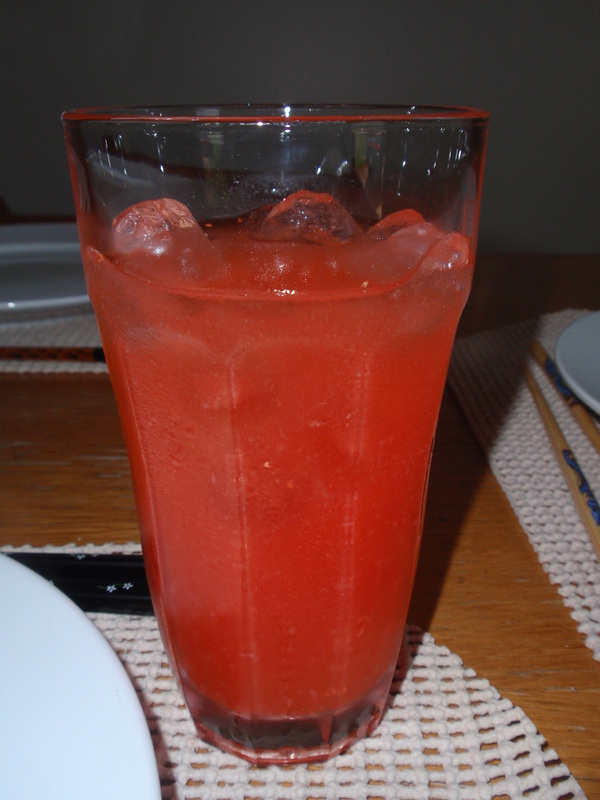 I think I will have to make this drink a summer tradition, since it is the perfect summer refresher! I made these cookies to have during the drive to Branson. I had wanted to try them for quite a while, but just hadn’t baked them yet. As far as I can remember, this is the first time that I’ve ever made oatmeal raisin cookies. 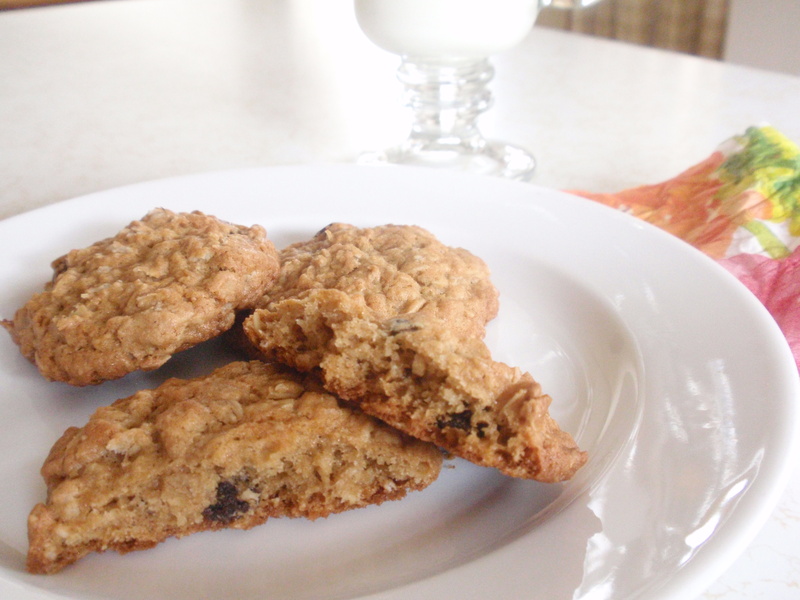 The go-to cookie in my house has always been chocolate chip cookies, but recently I thought, “oatmeal raisin cookies sounds so good, I have to make some.” In my opinion, they made a great road trip snack. Any dried fruit can be substituted for the raisins. Be sure the cookies are completely cool before storing in an airtight container. In a medium bowl, whisk together flour, salt, cinnamon, baking powder, and baking soda. Set aside. In the bowl of an electric mixer fitted with the paddle attachment, combine butter with both sugars, and beat until light and fluffy. Add vanilla, milk, and eggs, and mix well. Add flour mixture, and beat until just combined. 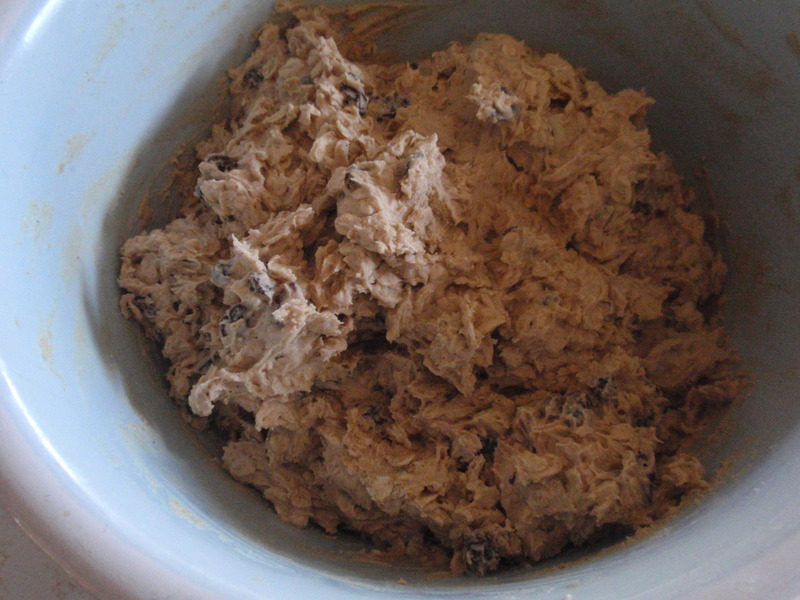 Remove bowl from the electric mixer, and stir in oats and raisins. Place dough in the refrigerator until firm, about 2 hours or overnight. Heat oven to 350 degrees. 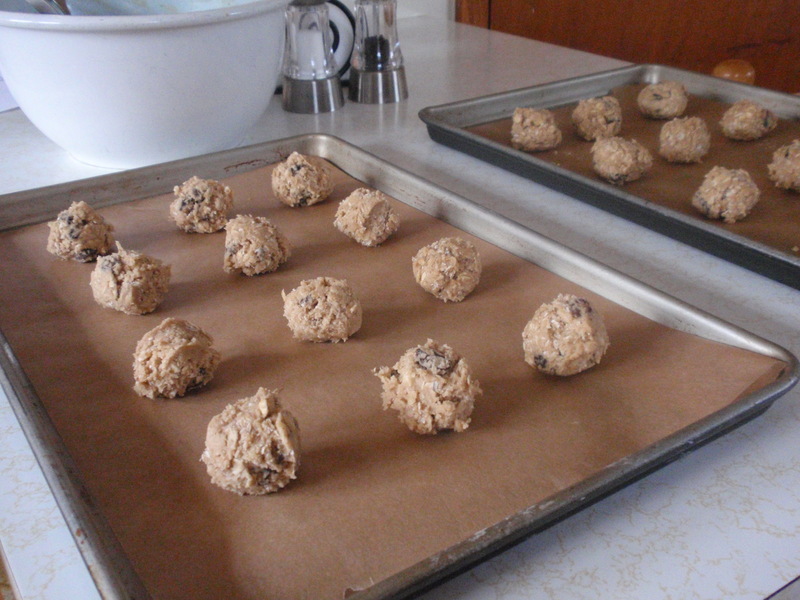 Line several baking sheets with parchment paper, and set aside. 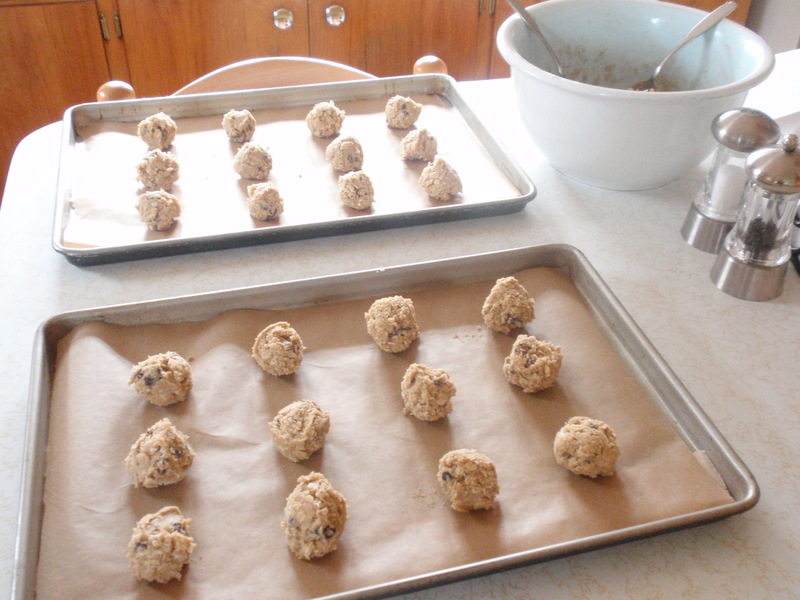 Scoop out 2 tablespoons of dough, and shape into a ball; place on one of the prepared sheets. Repeat with remaining dough, spacing balls 3 inches apart. Press down to flatten into 2-inch diameters. Transfer to the oven, and bake until golden but still soft in center, 16 to 18 minutes, rotating the pans between oven shelves halfway through baking. Remove from oven, and place on a wire rack to cool completely. Store in an airtight container at room temperature up to 1 week. The dough was very tasty cold, right out of the refrigerator! My first homemade Oatmeal Raisin Cookies! These cookies were wonderful! They were thick, and soft, and chewy, and delightful in flavor. I made mine with a heaping 1/2 teaspoon of cinnamon. I stored them in a freezer bag with a couple of slices of bread to keep the cookies moist and they were still good a week later, just as the recipe says they will be. Recipe courtesy of MarthaStewart.com, recipe title doubles as link to the recipe. Okay, so I will say a quick hello. My trip to Branson, MO is coming much faster than I would like. There are many things that I need to do, or would like to do, before I go and time is growing short! I am starting to feel like the Rabbit in Alice in Wonderland. And it certainly doesn’t help matters that I have such bad time management skills, either. Maybe it would help if I carried a stopwatch around with me wherever I go, like the Rabbit with his pocket watch? Either way, I will be busy these last few days packing for Branson, continuing to practice my driving, so I’ll be better prepared for the 14 hour drive there, and trying to fit in some writing time to catch up with pen pals and work on a post for while I’m away. When I return from my holiday, I will be sure to respond to any comments I have missed, or not gotten a chance to reply to before my trip. Well, I am a few days late for my Post a Week commitment. I think I should really write a couple of posts each week so that I can save some up for future weeks. Right now I’ve just been writing one post at a time, and that doesn’t work so well on busier weeks. Plus, I will be leaving for a trip to Branson, Missouri this Saturday, and I need to have a post ready this week that I can schedule to publish during my trip. I am so excited that I’ve received the “Versatile Blogger Award” from Cristina, the author of the blog 365 Days Photo Project. It’s always fun to be liked by people, but it’s especially nice for me to get this award from someone who I like so much! Thank you, Cristina! If you win this award, you have to pass it on to 15 other “Versatile” bloggers (but there are so many) and contact each of them to let them know they won the award. Also, you have to share 7 facts about yourself, and thank and link the person who gave you the award. 2. I have always loved animals, I can’t imagine life without them. I currently have 3 cats, and 1 dog (a Yorkshire terrier). 3. I am generally an agreeable person, but I can get very angry when people are dishonest or mean to other people. 5. I became a Christian when I was 4 years old. 6. I have always loved the idea of being a drinker of tea, but I have never really liked the taste of tea. 7. Talking to people over the phone makes me nervous, with the exception of talking to my mom or sister. 1. Cristina from 365 Days Photo Project – What I love about Cristina’s blog is that I can see from her photos and words that she is a kind and positive person! Cristina shares a photo each day with us, and I enjoy seeing her creativity and hearing about her day. 2. Grown Man from You\’re a Grown Man – Grown Man’s blog is like his own personal advice column. He always has wise words to share with his readers, and best of all, he shares those bits of wisdom with humor! His advice is often just as good for women as it is for men. He has not been updating his blog over the last few months, but his past posts are sure to make you think and entertain you all at once. 3. M.J. from Thoughts from a Brown Paper Bag Girl – M.J. is a wonderfully eloquent writer! She has meaningful things to say. The way she writes about everyday experiences never fails to infuse me with wonder and inspiration. She inspires me to look at life in a more poetic way. 4. Bonnie from Life of Bon – Bonnie’s blog is, as you’d suspect by the title, about Bonnie’s life. I like Bonnie. I see her as a spunky, adventurous person, 2 things that I aspire to be. I really enjoy reading about her journeys and adventures, and enjoy reading her thoughts on life. 5. Leah from Uprooted Magnolia – It almost never fails that after viewing and reading one her posts, part of my heart wants to uproot myself, just like Leah did, and to Wyoming. I love the beautiful photographs she shares with us of the wide open prairies, distant mountains, ranch life, and the wild animals of the west. It is her photos and the way she describes life on a ranch that tugs at my heartstrings; I can feel the cowgirl hiding in my soul longing to break free. 6. Leslie from Coffee, Pearls, & Grace – Leslie is a creative person, I like creative people. I always like what I read on her blog. I enjoy her blog because I like what she has to say, and the interests she has to share with us, and I often leave feeling inspired. 7. Tryityoumightlikeit from Try It You Might Like It – This blogger is a wife, and mother of 2 kids, and according to her, her husband and kids are all picky eaters. She shares with us her adventures in trying new recipes. Her goal is to make trying new things a way of life for her family. So many of the recipes she cooks are just the kind of things I like to eat, so I always love to see what she cooks up next! 8. Kristen from Daily Bailey – Bailey is a cocker spaniel poodle mix, Kristen is his mom. Kristen lets us tag along for their adventures, and, boy, is it fun! I dare you to look deep into Bailey’s big, puppy-dog eyes and not melt! Whether they are out and about at a dog park, having a party with Bailey’s best buds to celebrate his birthday, or having a lazy day at home, I am always excited to see what Bailey’s been up to, and he always brings some extra joy into my day. 9. Dan from a LEGO a day – Dan’s photos are creative and amusing. I always love it when the Inspector stops by to pay us a visit. The Inspector is very observant, just as he should be! 10. Petra from Zoom Yummy – I enjoy visiting Petra’s blog for the tasty recipes and crafty fun. Quite a creative gal that Petra. And she’s got a great name, too! 11. Sarah from Jettison2011 – Sarah has decided to jettison items that she no longer wants or needs to lighten her load. Her goal is one item a day. Visiting her blog inspires me to continue to jettison my own items that are weighing me down. Thanks for the inspiration, Sarah! 13. Jayne from AC\’s Scrapbook – One of my favorite thing about Jayne’s blog is her nature photography. She takes such beautiful photos of nature; they always brighten up a day! I also enjoy her thoughts on other subjects as well. 14. Leigh from Leigh Bakes – I just discovered Leigh’s blog recently; she hasn’t had a new post since I found her, but while looking through her previous posts at the delicious recipes she has made, I could tell that I would love her blog. I look forward to her next entry! 15. Leanne from The Shortlist – Leanne’s blog is a new discovery, also. She cooks and bakes a wide variety of foods, a lot of which looked extremely tasty to me. Being the lover of food that I am, I am sure I will be visiting her blog often! And to those of you who have taken part in my own blog journey, by way of reading and commenting, thank you! Last summer I started working at a family owned farm. The family that owns the farm decided to start a CSA (Community Supported Agriculture) and they teamed up with their elderly next door neighbor Mr. Pickett* who has grown vegetables all his life and has been selling his own veggies out by the road in front the farm for a few years now. A lot of the time I worked alone with Mr. Pickett, picking and selling veggies. I learned a lot about gardening from him, which I thought was really fun, because I would love to have a garden of my own someday. Mr. Pickett and I were getting along well. He really liked my work, so as vegetable season was coming to an end he started telling me about the plans he had for me for next year. I never really knew what to say to him about his plans, because I hadn’t decided for sure that I was going to work at the farm again this summer, but I hadn’t decided that I wasn’t going to either. Although there were things I loved about the job, there were also a lot of things that made the job not a very good fit for me. It was this March that I finally decided that I was not going to work at the farm this year. After making that decision I, of course, had to break the news to Mr. Pickett. This was the first time I’ve ever had to say no to a job offer, and to me, it felt a lot more like I was breaking up with Mr. Pickett than just declining a job. I was so worried that he would be upset or hurt by my decision. I knew he was planning on having me around to help him this year, and I felt guilty that I wouldn’t be there for him, but I also knew I had to do what was best for me. I was so stressed out and nervous about telling him. It took me a few days to get up the courage to call him. When I finally made the call, I told him that working at the farm wasn’t going to be a good fit for me this year, and that I was sorry I wouldn’t be able to work with him. To my relief he said that he wasn’t hurt, he was just disappointed. He ended up telling me that if I ever changed my mind and decided I would like to work there again, he would always have a job for me. So, in the end, it didn’t feel like a break up at all. I was so pleased with the way it turned out. When I got off the phone, I actually started dancing around the house from excitement and relief! I had gotten myself so worked up over the situation and thought it would turn out absolutely horribly, but it didn’t! What do you do when you have to break news like this to someone? Have you found ways to handle these types of situations to make them less stressful? *Name changed for the sake of privacy.